You’ve probably seen the meal prep trend online where dozens and dozens of meals are prepped in containers for the entire week? Holy moly. I can say that will probably never be me. I once tried an over-ambitious meal prep and not only did I end up with way too much food, but it took up most of my day. On the flip side, I’ve realized that my veggie intake falls pretty flat when I don’t do any prep at all. Soooo….there has to be a happy medium!? This little dilemma is exactly why I came up with a simple plan that totally fits into my life these days. The recipe below (which is totally customizable!) 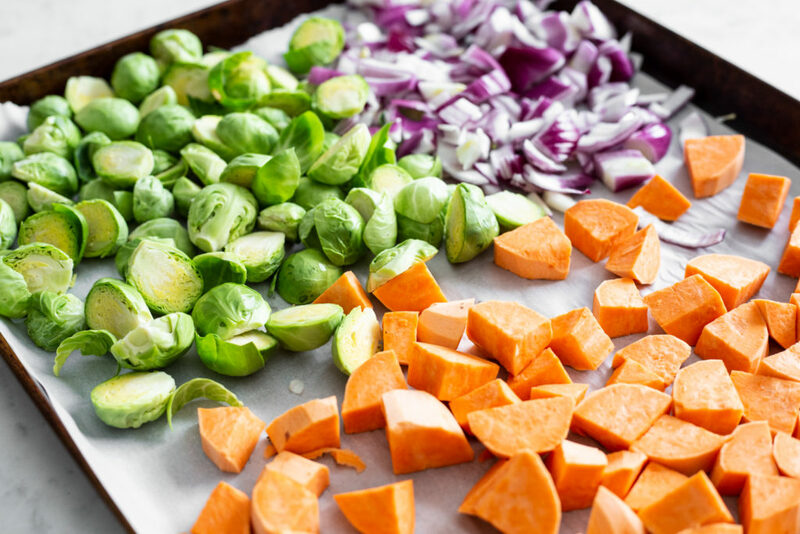 takes less than 30 mins of active prep time, but makes enough food for several portions, increasing the odds that you’ll be a veggie powerhouse for the workweek. 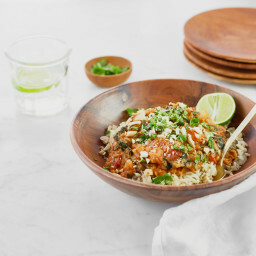 *arm flex* I love how I can quickly reheat a couple things and build a hearty, nutritious bowl in a matter of minutes! 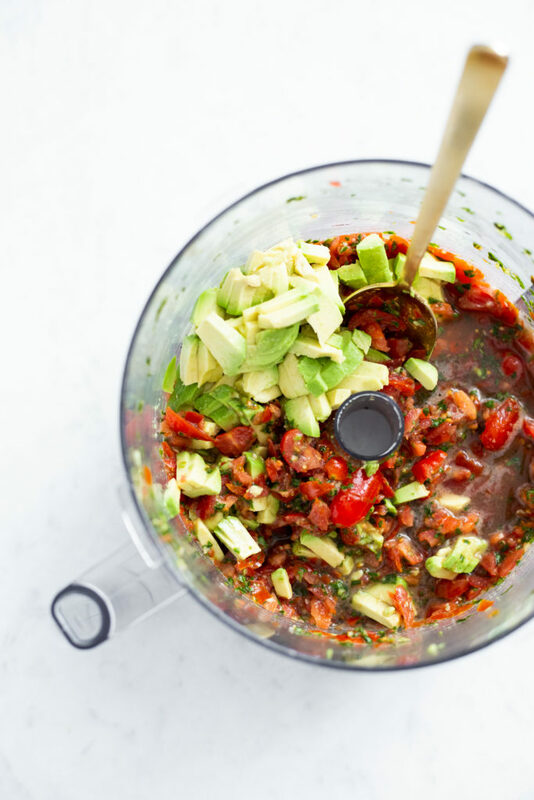 Have toppings on hand, ready-to-roll—things like avocado, nuts/seeds, beans, dressing, etc. 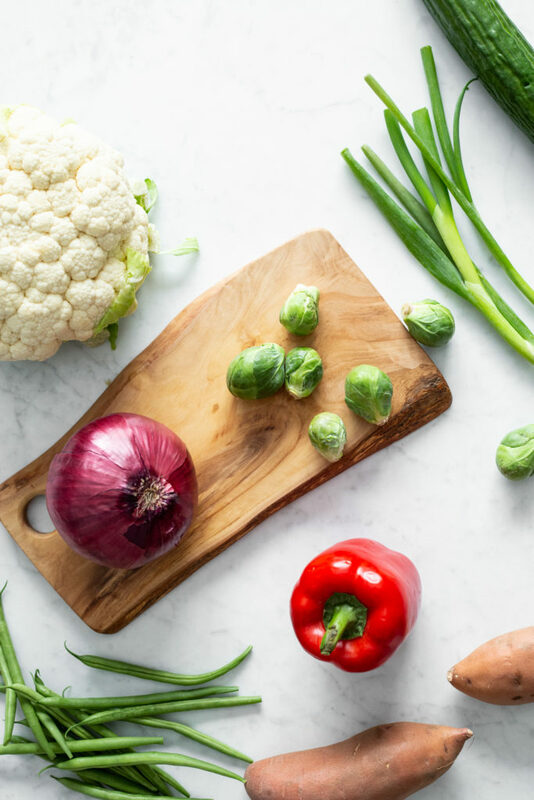 This method has dramatically changed my meals in recent weeks (specifically, lunches) and increased my veggie consumption a ton. 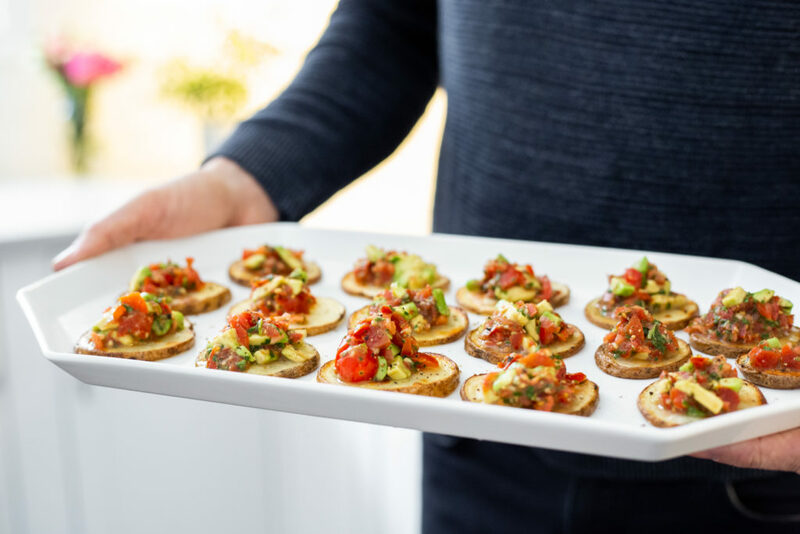 All of the ingredients can be changed up so it never has to be repetitive and you can be flexible with using what you have in your fridge/pantry. 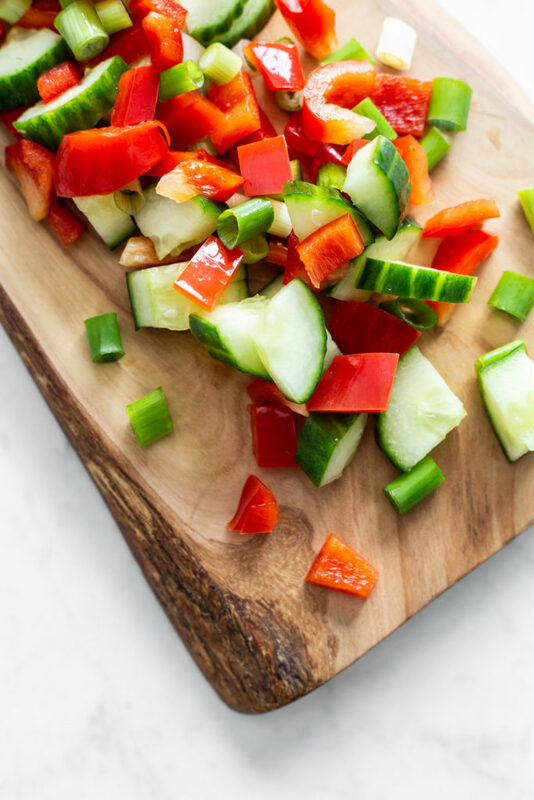 It helps cut down waste because you can easily use up those “on the verge of dying” veggies in your crisper. Just throw ‘em in the oven and roast the heck out of ‘em! And if you get tired of bowls, throw the prepped food into delicious wraps or even soups/stews. I’ve provided a detailed recipe below because it helps to have something to work from the first time, but like I said, feel free to run with it. 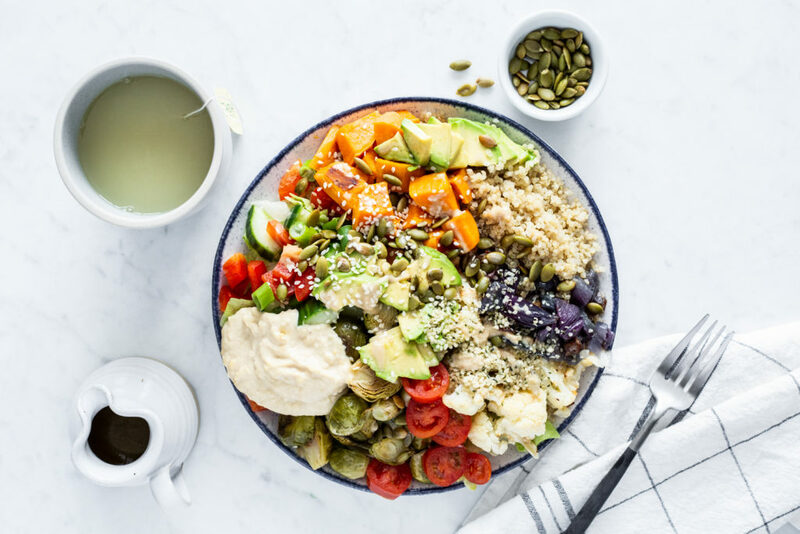 If you simply commit to roasting 2 big sheets of veggies, cook a grain, and chop some fresh veggies….you’ll be well on your way to making easy throw-together power bowls all week long. My future hangry self has been thanking me a lot. I love having prepped food in the fridge, but don’t love doing hours of meal prep each week. So I came up with this simple method that takes just 25 minutes of active prep time. The healthy food components can be enjoyed for several days in power bowls, wraps, and even stirred into soups! 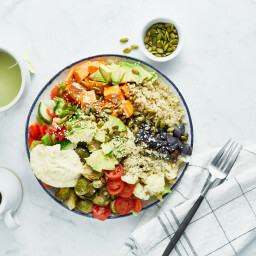 Power bowls are so fun for family meals because you can switch up the veggies and toppings to suit each palate, giving kids control to build their own bowls. This recipe is also a handy make-ahead option if you’re having friends over for a meal. Simply chop all the veggies the night before and refrigerate them in containers. 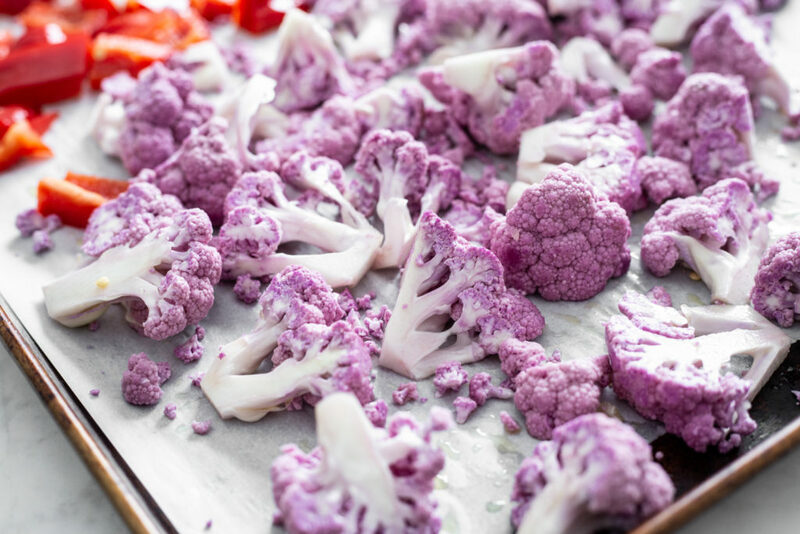 Just before your guests arrive, pop the veggies into the oven, cook the quinoa, and prep the toppings. 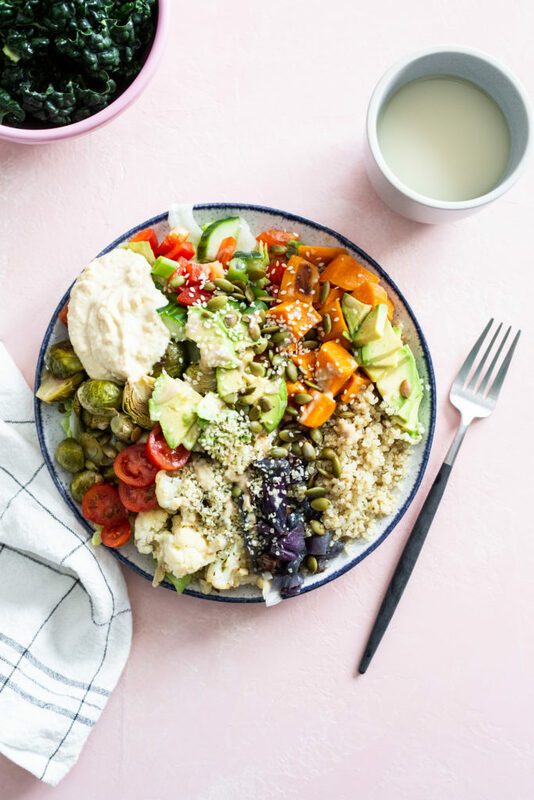 After cooking, you can all have fun assembling your own power bowls and everyone will be super impressed by the stunning rainbow-coloured meal! Position two oven racks near the middle of the oven. Preheat the oven to 400°F (200°C) and line two extra-large (15- x 21-inches) rimmed baking sheets with parchment paper. 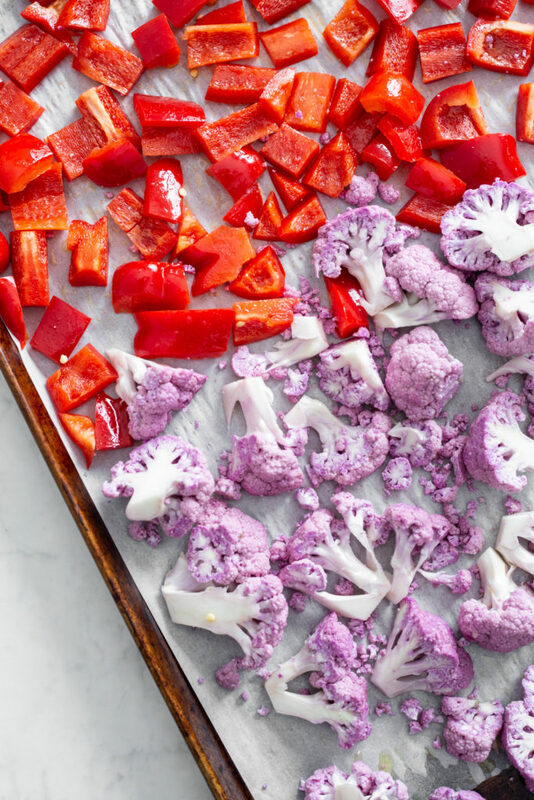 It’s important to use extra-large baking sheets so there’s enough room for all those healthy veggies. 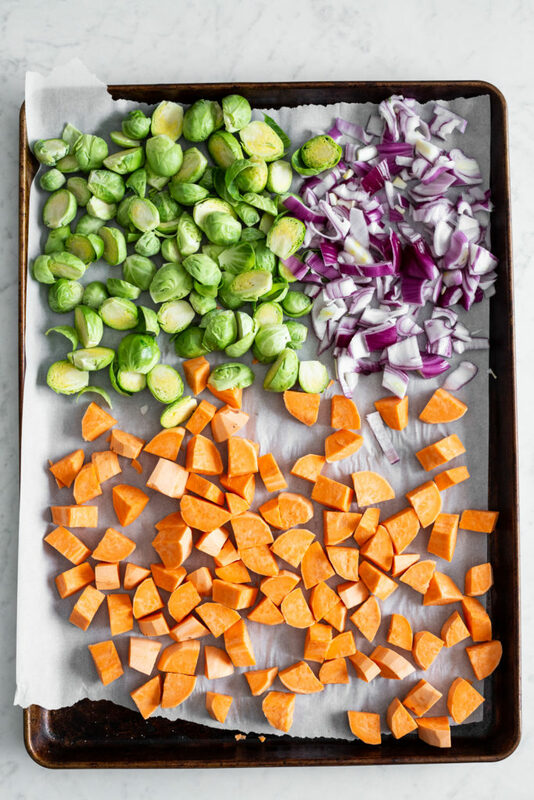 Divide the chopped, “to-be-roasted” veggies onto the baking sheets. Drizzle 1 1/2 tablespoons of oil over top each sheet and toss the veggies until they’re fully coated in the oil. Sprinkle generously with salt and pepper. Roast the veggies for 30 to 40 minutes (I find 35 minutes is perfect in my oven for lightly charred veggies) until fork tender and golden. There’s no need to rotate/move the pans or flip the veggies halfway through baking unless you’re particular about even cooking. While the veggies are roasting, add the quinoa to a large pot along with 3 1/2 cups (875 mL) water. Stir. Bring to a simmer over medium-high heat, then immediately reduce the heat to low-medium, cover with a tight-fitting lid, and cook for 12 to 14 minutes, until the water is absorbed and the quinoa is fluffy. Remove the lid and fluff the cooked quinoa with a fork. While the quinoa cooks, chop the cucumber and green onions. Rinse the tomatoes (I hold off slicing them until just before serving). 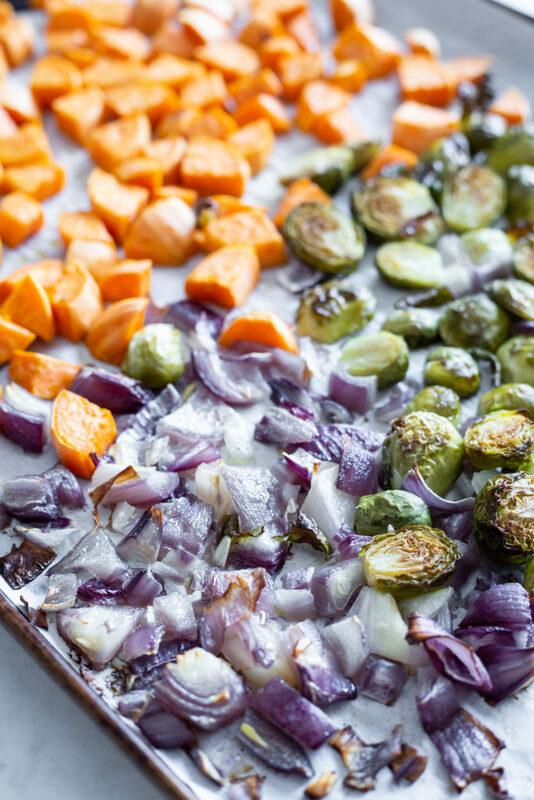 Remove the roasted veggies from the oven. Once mostly cool, transfer all of the veggies and quinoa into containers, seal with airtight lids, and place into the fridge for up to 4 days. 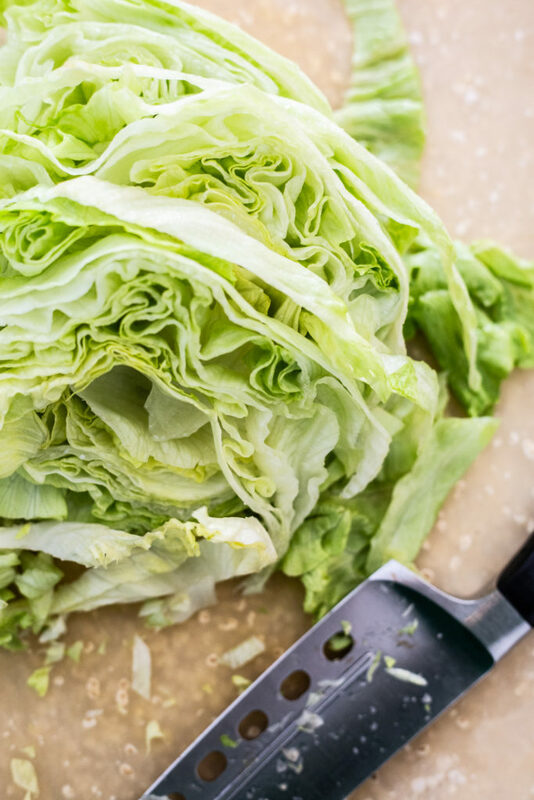 To make the power bowls: Add a couple generous handfuls of chopped lettuce/greens to the bottom of a large shallow bowl. Drizzle with a bit of dressing and toss the lettuce/greens until coated. Top with spoonfuls of your prepped food (quinoa, roasted and fresh veggies)—I always warm up the quinoa and roasted veggies first! Now, add diced avocado, more salad dressing, cooked beans or lentils, nuts and seeds, and hummus or pesto. 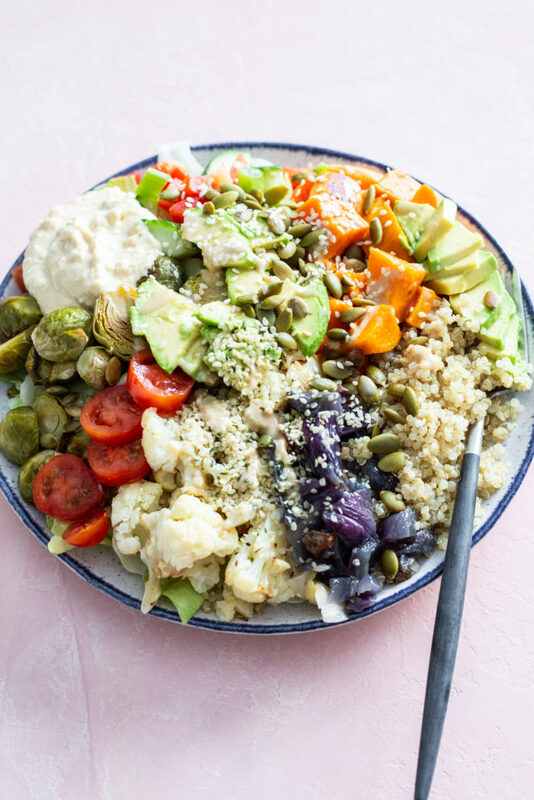 Keep the power bowl flavours interesting by changing up the toppings each day! Nutritional info includes all roasted veggies (with 3 tbsp olive oil), 1/2 teaspoon salt, quinoa, and fresh veggies. It does not include toppings. * If your brussels sprouts are quite large, quarter them instead of halving. ** If you don't think you'll eat this much quinoa in 4 to 5 days, feel free to halve this amount (use 1 cup uncooked quinoa + 1.75 cups water). *** Looking for a delicious homemade dressing? Try my Lemon-Tahini Dressing, Shake-and-Go Balsamic Vinaigrette (Oh She Glows Every Day, p. 273), or Roasted Garlic and Red Wine Vinaigrette. I always keep Maison Orphee Italian on hand when I don't have homemade dressing prepped. Feel free to roast a head of garlic along with the veggies. The roasted cloves are especially delicious thrown into my Roasted Garlic and Red Wine Vinaigrette found in my Warm + Roasted Winter Salad Bowl recipe. 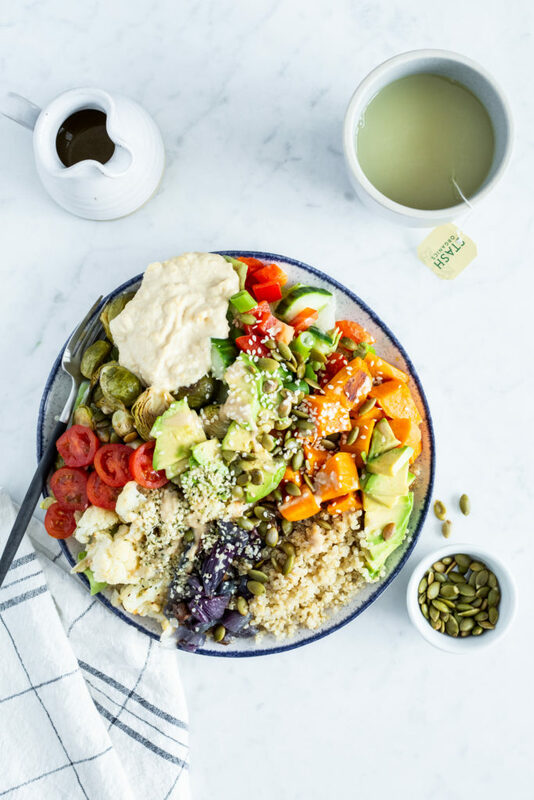 Make it nut-free: Top your bowl with seeds (such as roasted pepita seeds and hemp hearts) instead of nuts and make sure your dressing is nut-free. Do you ever feel like you’re on the verge of a breakthrough, but you’re not quite sure how you’ll do it? This has been my mindset lately. I’ve been so inspired in different areas of my life to create meaningful change with things like personal growth, career dreams, family life, etc. You could say that a little self-help inspo has struck me! I’ve felt stuck with indecision and fear for a while now, and the motivation finally hit me to actively do something about getting unstuck. It’s easy to just go through the motions each day. For most of my life, I’ve always been trying to “fix myself”…this can be a positive thing (such as when I’m trying to be the best version of myself I can be), but it can also turn into a very toxic mindset. It’s easy for me to veer to the dark side of self-improvement and lose sight of my qualities and self-worth. Anyone who suffers from this tendency knows that it’s not a particularly fun way to live. You never feel “ready” because there’s always something to fix or a goal to achieve before being worthy of your and others acceptance. I’m working to make progress in this area. It’s kind of hard to explain, but maybe you can relate? I have Dr. Brené Brown to thank for my recent bout of inspiration. I first became enamoured with Brené after watching her TED talk on vulnerability years ago and listening to her on Oprah’s SuperSoul Conversations podcast. I’ve read The Gifts of Imperfection twice, and plan on reading it a third time soon (it’s a quick read and easy to devour in a couple evenings). There’s so much wisdom to soak up, and I learn things each time I read it. Currently, I’m reading Daring Greatly (which I’m finding slower, but still learning from it), and hope to read this one and this one next. I’ve been carving out some reading time in the evenings lately, and it feels so good to get back into it! I’m also (late to the party) using my Kindle reader on my phone and love how I can read a few pages here and there while I’m waiting for an appointment or when I have time to kill. I’d love to hear if you’re reading anything inspiring lately too! The first time I made this healthy comfort food recipe, Eric and I had the song Ave Maria playing (Michael Bublé version...so hypnotizing! 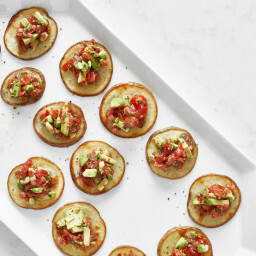 ), and we fell into a trance as we ate crispy round after crispy round of potato bruschetta. Needless to say, we heard the angels singing and I think you will, too! 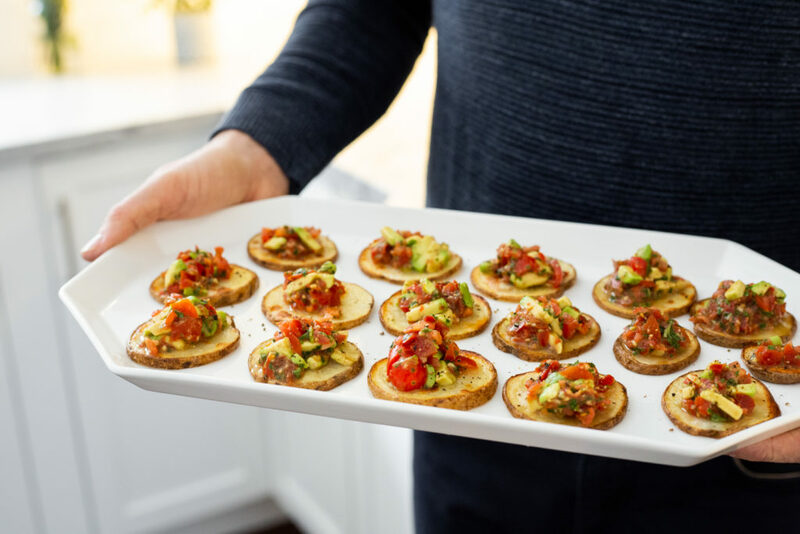 This recipe serves two hungry people as a main or five as an appetizer. The best tip I can give you when making these is to serve it directly on the baking sheet (if you can!) as it keeps the rounds a bit warmer compared to transferring to a platter, and also to top the rounds and serve them right away. If they sit for longer than 10 minutes, they’ll start to lose their fantastic crispiness and soften considerably. 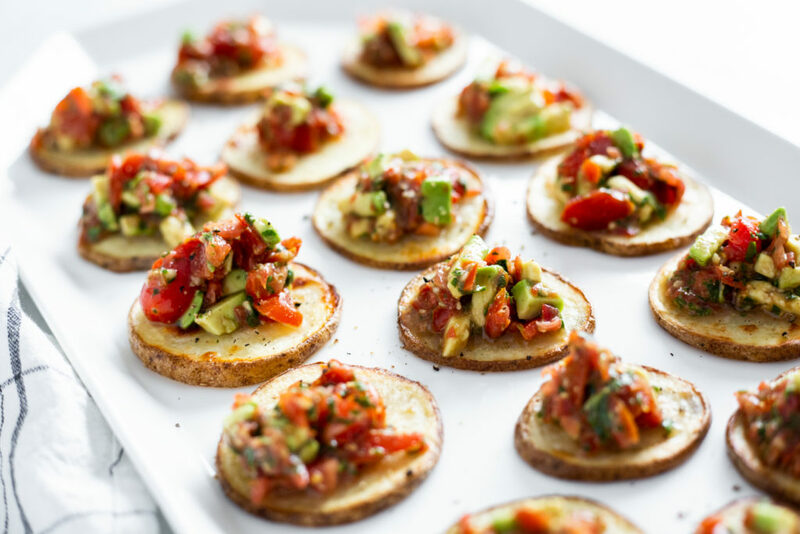 This recipe is inspired by the Taco Fiesta Potato Crisps in The Oh She Glows Cookbook (also a delicious appetizer option!) and Potatoes USA. 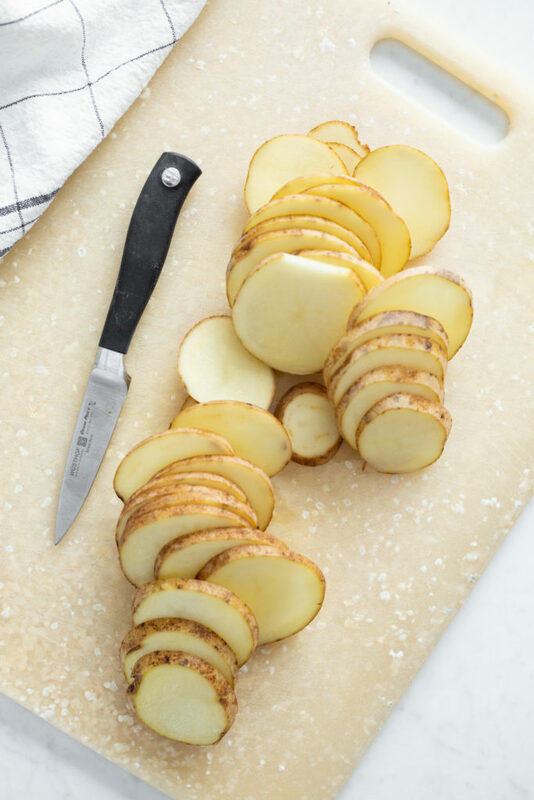 With a sharp knife, slice the potatoes into 1/4-inch thick rounds. Make sure they’re not any thinner than that, or they might not be sturdy enough to pick up with your hands and the edges will burn more easily while cooking. Place the rounds into the centre of one baking sheet in a mound. Toss with the oil until all sides of the rounds are fully coated. Spread into a single layer, spacing them a 1/2-inch apart. Sprinkle liberally with salt. 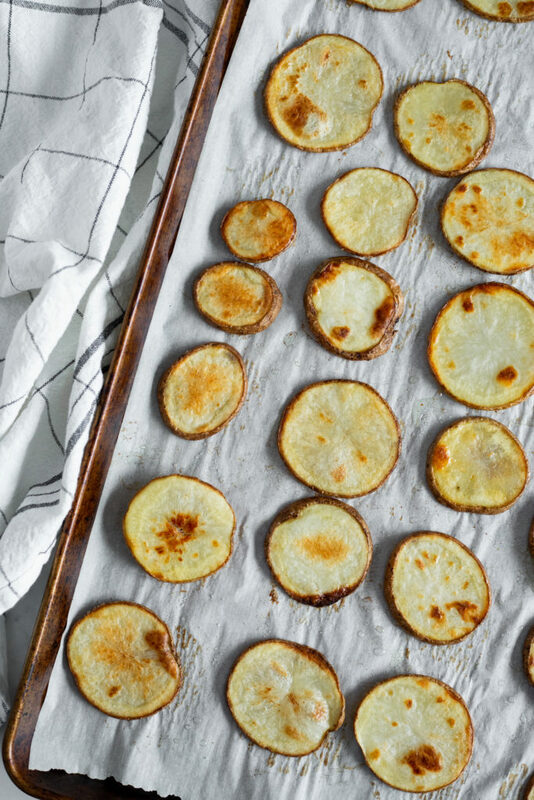 Roast the potatoes for 25 to 35 minutes (I do 30), flipping once halfway through baking, until tender and golden brown in some spots. I prefer these slightly overcooked so they’ll crisp up a bit around the edges. 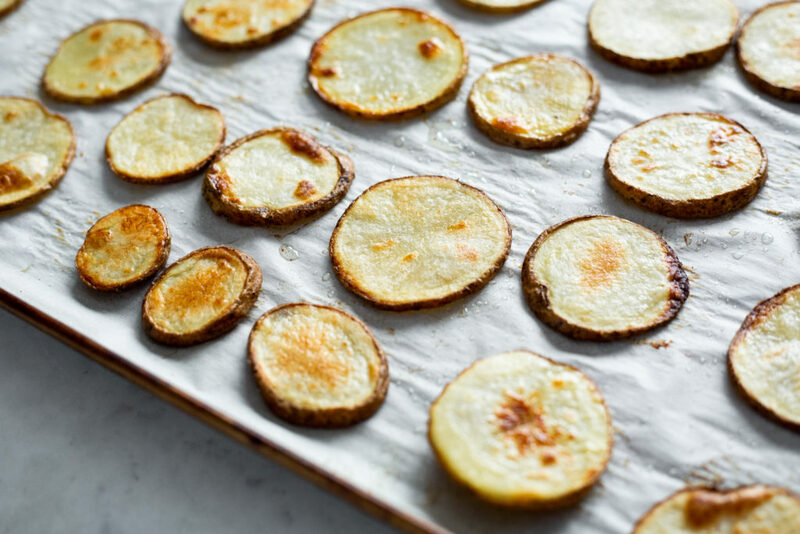 After removing the potatoes from the oven, add another generous sprinkle of salt on top. 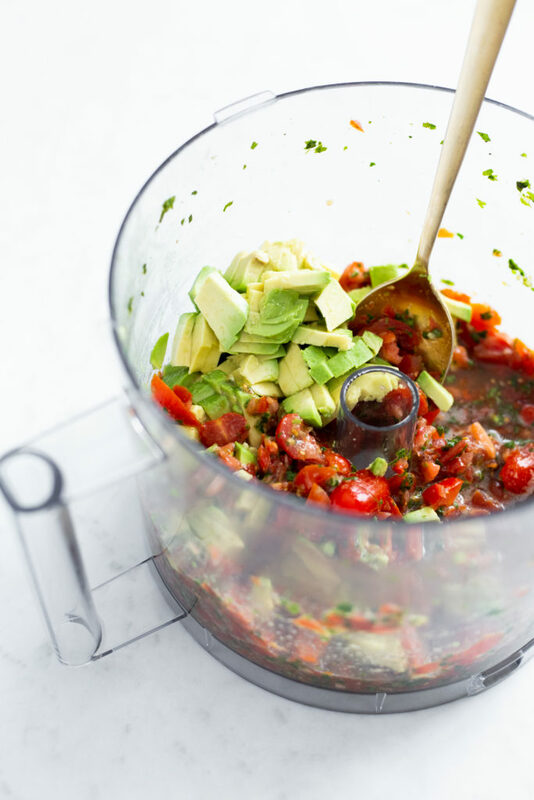 Add 1/2 to 1 tablespoon avocado-tomato mixture onto a fork and strain out the juices by tapping the inside of the bowl. Place the strained mixture onto the centre of a potato round and repeat this process for the rest of the rounds. 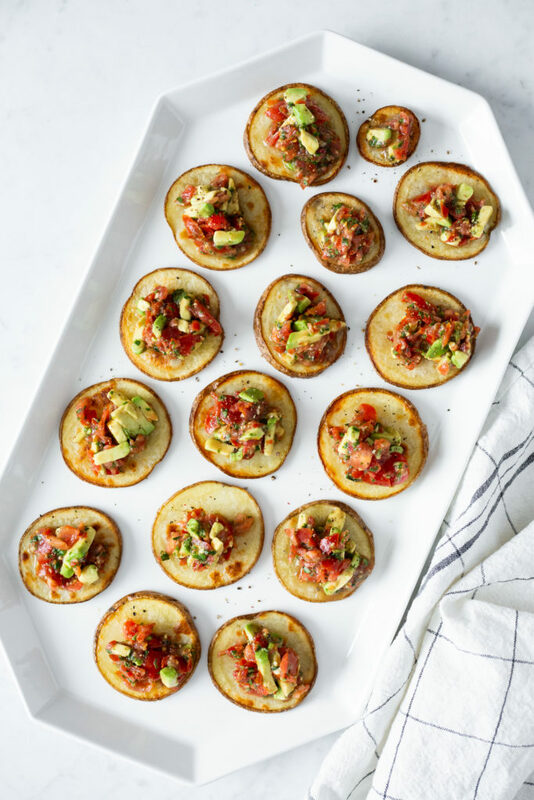 Serve immediately, directly from the baking sheet(s)—I find serving from the baking sheet keeps them warmer, but if you prefer you can transfer the rounds to a platter before adding the topping. If the potatoes sit they will soften and lose their crispness, so I don’t recommend letting them sit around for longer than 10 minutes (usually not a problem in this house!). 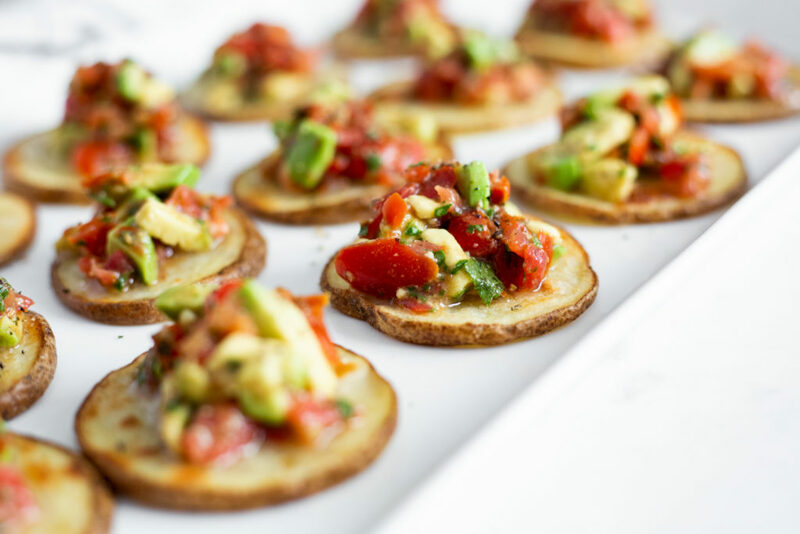 If you have any avocado-tomato mixture leftover feel free to polish it off with some tortilla chips! 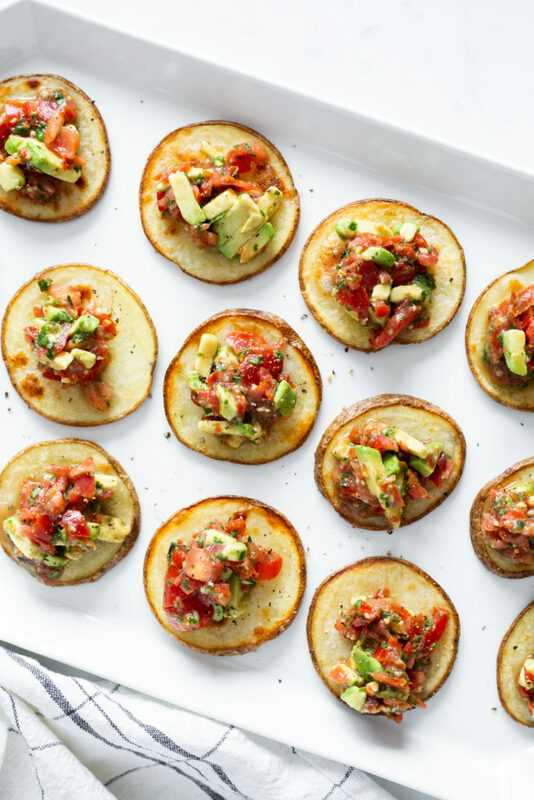 Recipe serves 5 as an appetizer (6 potato rounds per person) when making 30 rounds total. Up the glow factor: Sprinkle my Vegan Parmesan Cheese on top. 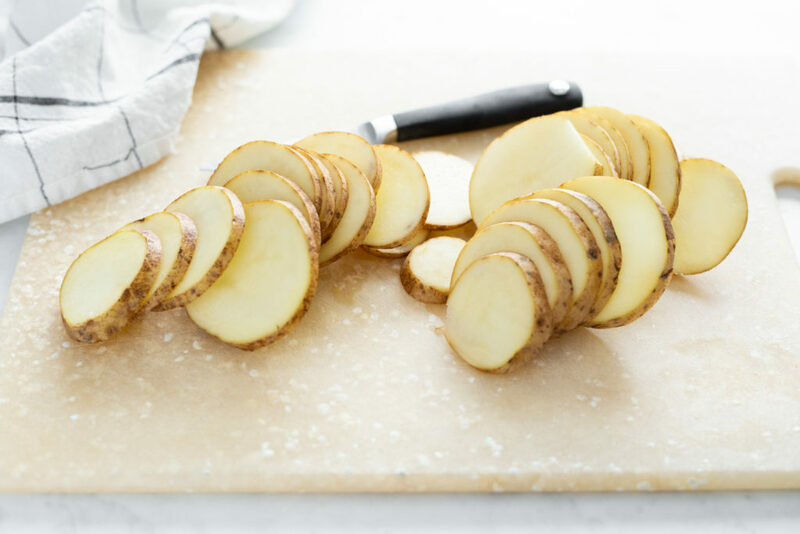 Should your potatoes become soft from sitting for too long, these reheat well on a sauté pan, preheated over medium heat, for 1 to 2 minutes. This results in slightly browned bottoms and revives the firm texture without affecting the toppings. Oh Eric, what a sport for being my food photography model, hah. There were some heavy sighs when his arms got tired…no one said being a model was easy! Okay, maybe they did say that…but just ask Eric about the struggles! 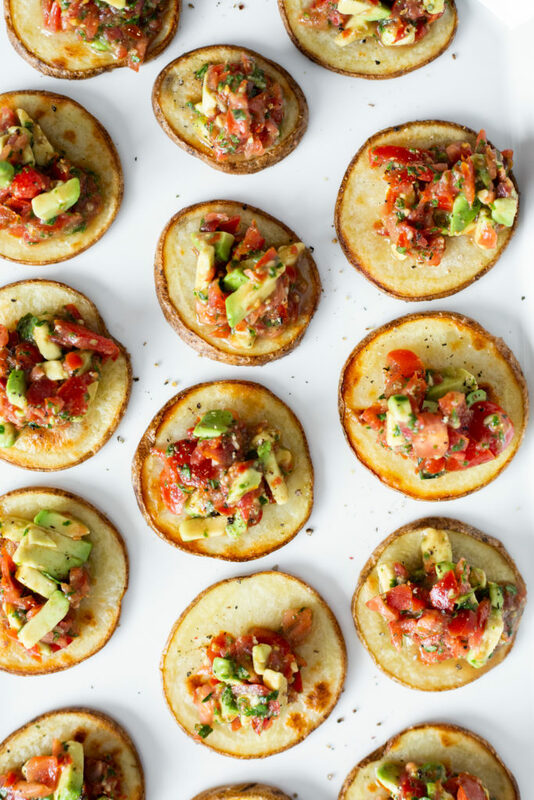 In case you’re wondering – these “photoshoot” potato bruschettas were SO COLD by the time we finally got to eat them. Sniff, sniff. But they were still worth eating! And we’ve enjoyed them many times piping hot out of the oven which is simply the best. If you try them out, I’d love to hear what you think and see your photos, so don’t forget to tag them with #ohsheglows on social media! 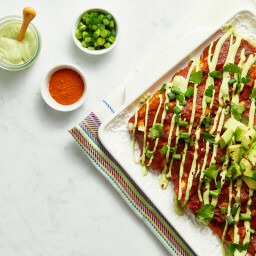 Hi, I'm Angela and this is my recipe blog where I celebrate my love for plant-based food. In addition to being meat and dairy-free, most of my recipes are free of gluten, soy, and processed foods. Feel free to read my story on my About and Before and After pages. Not sure what to make first? Check out my popular recipes page.